ALLOWS CONNECTION OF A COMMODORE COMPUTER TO A MODERN / TV STANDARD COMPOSITE VIDEO JACK (YELLOW RCA JACK). INCLUDES DUAL MONO AUDIO CHANNELS. COMPATIBLE WITH VIC20 C64 AND C128. (SUPPORTS NTSC AND PAL). This cable is used to connect the Monitor port of your Commodore to the Video inputs of your modern TV (the RCA jacks on your TV) . 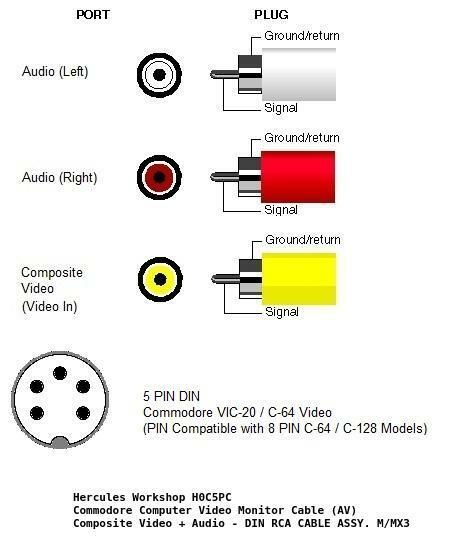 Any video display monitor that supports composite video input (this includes almost all modern televisions) should be able to display the Commodore's composite video signal (on your TV it's the RCA jack, usually YELLOW and labeled VIDEO IN). See photos for connection example. The VIC-20 composite video is optimized for use with an external RF modulator and may require adjustment for colour correction. The colour maybe adjusted through two tiny potentiometers located in the video circuit inside the VIC-20. Please see the adjustment photo.